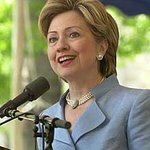 Hillary spoke at the 2007 Human Rights Campaign Gala. She was recognized for her long-time commitment to empowering women by Vital Voices in 2009. Google trends for "Hillary Clinton"